Hyssop Lavender Licorice Mint Agastache Foeniculum is a herbaceous perennial that belongs to the mint family. 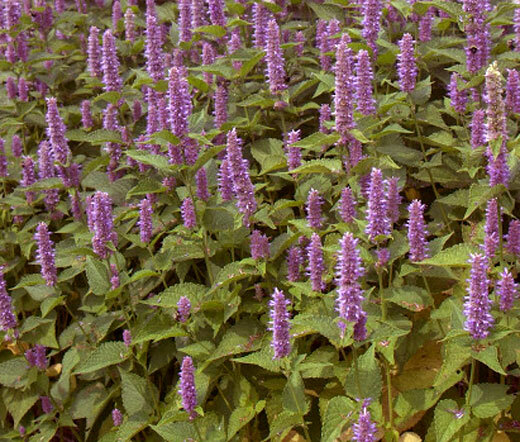 If you plant to cover a large area, Lavender Hyssop bulk seeds are a great way to establish this flowering herb. Also called Blue Giant Hyssop, and Anise Hyssop, Agastache has light-green foliage with lanceolate in shape, anise-scented leaves and erect, sturdy flowering stems that terminate in spikes of very fragrant, small, tubular, blue-violet, lavender flowers. The entire Blue Giant Hyssop plant is fragrant, and its mint-licorice, anise scented flowers attract honeybees, butterflies, and hummingbirds. Hyssop Lavender Licorice Mint is often grown as a nectar source for honeybees, and this clump-forming perennial flower is very popular for planting in herb gardens, borders, containers, meadows, flower beds, and wildlife gardens. It easy to germinate Agastache Foeniculum bulk seeds, and no any special treatment are needed prior sowing the seeds. The established Lavender Giant Hyssop is easily grown in average, dry or medium-moist soil, and the full sun is preferable, but Hyssop tolerates partial shade. Blue Giant Hyssop makes an excellent fresh or dried cut flower.